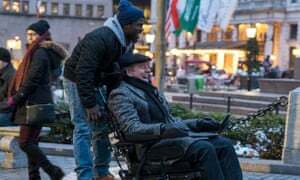 2011’s Les Intouchables, a French film based on the true story of a wealthy quadriplegic who hires an ex-con as his live-in caregiver, received numerous accolades from critics and was a hit with audiences. It went on to become one of the most successful French films of all-time, so of course, an American version was inevitable. 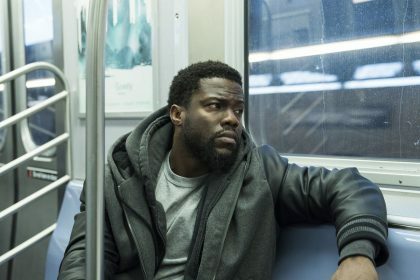 Recently paroled Dell Scott (Kevin Hart) is doing his best, or rather, doing the absolute minimum, to stay out of prison. One of the conditions of his parole is that he must find a job, or at least provide proof that he is actively searching for one by obtaining signatures from potential employers. He shows up to a penthouse responding to what he thinks is a janitorial position and ends up unknowingly interviewing to be a caregiver for businessman Phillip Lacasse (Bryan Cranston), who is “richer than Jay Z.” Lacasse, a quadriplegic from a paragliding accident, still grieves the loss of his beloved wife, and is just biding time until someone can carry out his “Do Not Resuscitate” order. He feels Dell is just the right person to do that and is also amused by his bluntness and spunky personality. Dell isn’t very excited about the offer, at least until he finds out what it pays and learns that it’s a live-in position, complete with a fancy German-speaking shower in a bathroom larger than most New York City apartments. He accepts the job, hoping too that it will help repair his fractured relationships with his ex and young son, who he fears will head down the same wrong path that he did. Phillip’s business adviser and trusted confidante Yvonne (Nicole Kidman) is not too pleased with his under-qualified choice and keeps a close eye on Dell, giving him three strikes to prove he is fit for the job. If any recent film has had the odds stacked against it, it’s certainly this one. 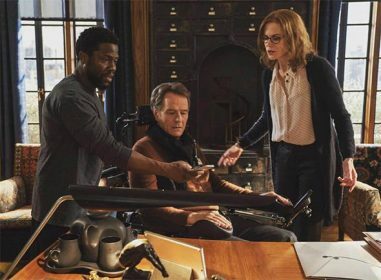 Directed by Neil Burger, The Upside was originally developed and produced by The Weinstein Company in 2017 and was scheduled for release in March of 2018, right around the start of the #MeToo movement and the downfall/reckoning of Harvey Weinstein. The film was shelved, later purchased by STX Entertainment, and finally set for release in January 2019. 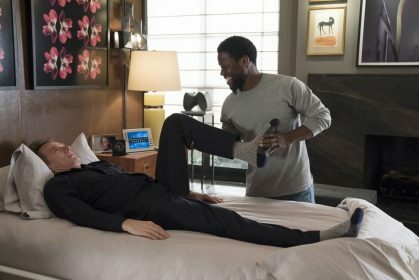 It seemed to have dodged the Weinstein bullet well-enough (all references to the name have been scrubbed) and the release perfectly coincided with its star Kevin Hart being announced as the host of this year’s Academy Awards. But bad timing struck again, as controversy over some of Hart’s problematic past tweets came back to haunt him, resulting in his losing the hosting gig (it’s really too bad that we hold our Oscar hosts to a higher moral standard than we do our elected officials, isn’t it? ), and his following apology/non-apology tour of ill-advised public statements and interviews that hurt more than helped. Pile on some additional backlash against the film (and Cranston himself) from the disabled community for hiring an able-bodied actor to portray a character with a disability, and whew boy, was this movie turning out to be a publicity nightmare! Despite everything it had/has going against it though, The Upside is not a bad movie. In fact, I enjoyed it quite a bit. The whole film rides on how well the two leads work together and, well, it hit a damn jackpot there. Cranston and Hart have fantastic chemistry and the best and funniest scenes are of the odd couple playing off each other. While Cranston and Kidman are reliably great, this is a more dramatic turn for Hart, and he displays surprising range in his performance. His usual hysterics are thankfully kept to a minimum and the role allows for him to showcase more natural and nuanced acting. Yes, there are over-the-top moments (a scene involving his character freaking out over changing a catheter gets some laughs and then turns a bit uncomfortable given his recent controversy), but for the most part this is a much more subdued performance that will likely change many people’s perception of what the actor is capable of. 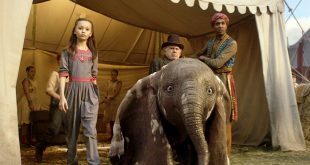 Though it passes the two-hour mark, the film moves along at a brisk clip. And even with what feels at times like outdated takes on the themes of race and class, it’s mostly inoffensive and has good-intentions. 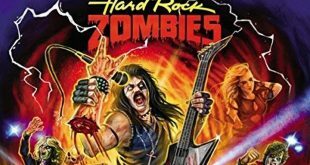 As is par for the course in these types of movies, especially those based (somewhat) on true stories, it gets a little cliché and pandering at times, following a predictable pattern of boxes to tick. We know the unlikely pair will get off to a rough start. We know they will form a friendship, each learning things from the other that will help their individual situations and become better people as a result. 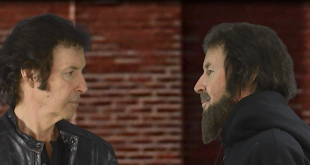 We know there will be some kind of conflict that will lead to a falling out and then an eventual reconciliation complete with swelling music designed to draw tears from the audience. We know it will end on an uplifting note, and it does, quite literally. Even if you haven’t seen Les Intouchables, you’ve seen this movie before. Nicole Kidman is always a welcome addition to any film, but unfortunately, she is mostly wasted here. Her character doesn’t get much of an arc and she is ultimately relegated to the role of stern, dutiful, assistant and (maybe?) romantic interest. Still, she does what she can with it because she is Nicole Kidman and that’s what she does. This isn’t a great movie and most people likely won’t even remember much about it (aside from all the controversy) when it comes time for “Best of 2019” lists, but for what it is, it’s just fine. The performances are great, there are plenty of laughs, and it is heart-warming enough to walk out of the theater feeling pretty good. Take your mom to a matinee. Or don’t.